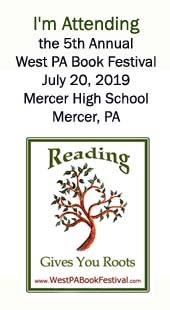 The Fifth Annual West PA Book Festival, featuring Western Pennsylvania and surrounding area authors, will be held in beautiful Mercer, PA at Mercer Area High School on July 20th, 2019, from 10 am to 4 pm. The book festival came about as the result of an effort to gather local authors to do combined events and in imitation of large and spreading book festivals across the country. LK Hunsaker is an Illinois native who moved to Western PA over 10 years ago because she and her husband were attracted to the area's hills, lakes, and greenery. With 17 self-published books and a contracted novella out under two names, she also runs an online writer's group for independent authors and owns her own publishing company where she formats, designs, and illustrates her books. She has background in event planning, to include a large music-centered fest with a guest artist from overseas that brought people in from all over the country. Mollie Lyon is a Shenango Valley native who lived in New England for a time before returning to Western PA. A career registered nurse, Mollie has three books to her name with more in the works. She also writes for The Way It Was - Mercer County. Cathy Coulter is a Western PA native who lived temporarily in northern Illinois before returning home. A genealogy researcher and educator, Cathy writes non-fiction and children's books and volunteers with the Grove City Historical Society. Shawn Riniti is a Pennsylvania native. An educator by trade, Shawn is also a nearly life-long musician and composer. He writes thrillers, offers his readers live video updates, and keeps otherwise busy with his wife and four kids. We would also like to thank Authors Rhonda Paglia and Gene Jordan for their work on previous festivals! Our authors live in the area between Erie and Pittsburgh, out toward Oil City, and one or two are from just over the Ohio or New York border. We write in many different genres and have a variety of experience, from new authors to long established authors, traditionally published and indie published. If you are a published author within this area and would like to participate, please email us at the address in the sidebar. If you are a working author not yet published and would like to volunteer at our children's activities area or otherwise, we would love to have you! It's a great networking opportunity. We also have a private Facebook group where we share information. Email us to be included. We also extend an invitation to local literacy and service-related groups to set up without cost to share what they have to offer book lovers and the community in general. At each book festival, we provide literacy activities for children at no cost. Our authors and library groups have provided story times through the events. During our 2017 Book Festival, and afterward, with assistance from Pizza Joe's Mercer, we raffled 4 author-donated school supply baskets. From the raffle, we were able to give Brandy Springs Park a $40 check to assist with maintenance needs. In December 2017, we sponsored a T-shirt sale to support the Children's Aid Society of Mercer County. Thanks to those who supported the fundraiser, we were able to add $98 to their mission of assisting children waiting for placement. Please come out to the festival, follow our Facebook page, and help support our local authors as well as literacy and community in the West PA area! Excited!! Looking forward to this lovely event! Come out and support your local authors! !